One of Canada's longest running women's development teams will be fielding a leaner seven rider team in 2019, but will still be looking to make an impact at a National and North American level. Led by past National Road Race Champion, World Championships and Commonwealth Games Medalist Annie Foreman-Mackey (Kingston ON) the team contains a lot of familiar faces. Foreman-Mackey is joined by fellow Commonwealth Games medalist Ariane Bonhomme (Gatineau QC), and last year's silver medalist at the Elite Canadian road championships Kinley Gibson (Edmonton AB). 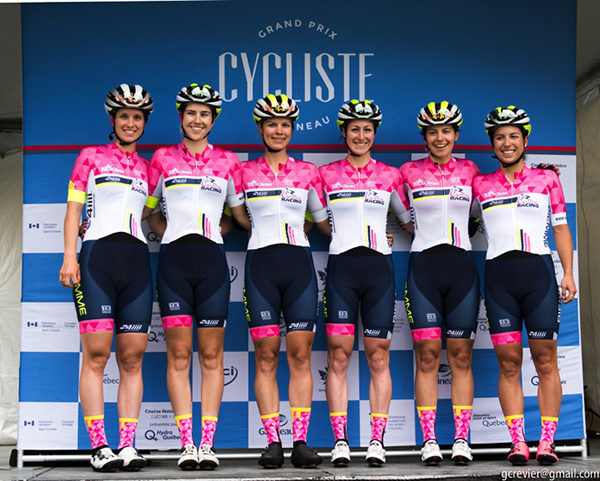 The team will again compete with some Italian flare, riding DeRosa bicycles and wearing a range of custom Biemme apparel for all seasons and conditions. Long time eyewear partner Smith Optics is extending their support to provide the team with their innovative line of Koroyd MIPS helmets. Returning to the team are a number of Cycling Canada's NextGen track riders, including Junior World Championships medalist Devaney Collier (Edmonton, AB), the versatile Miriam Brouwer (Burlington, ON) and former National Junior Road Race Champion Laurie Jussaume (Contrecouer, QC). New to the team is Erin Attwell of Victoria BC. Another road and endurance track racer, Attwell was 2016 Junior National Road Race Champion and medalled on the Track World Cup last season in Minsk (along with new teammates Collier and Jussaume). The Cyclery, Ottawa's premier bike and Nordic ski store, and has supported the Women's team for nearly a decade as a passion project for this successful business. Over the years a huge number of women racers have been able to chase their cycling dreams under the Cyclery Racing banner - including current National Champ Katherine Maine who turned professional for the American Rally team after riding for the Cyclery in 2015. A number of long running Cyclery racers have moved on for 2019. Both Amelie Bruneau and Catherine Ouellette (who won a U23 National title with the Cyclery in 2017) have retired from competition and Emily Flynn has moved on to the professional criterium team LA Sweat. The Cyclery wishes these family members well in their future endeavour and thanks them for everything they did to build a fantastic team culture in their years with the squad.